How to assemble non-biological and biological materials into artificial structures that look and behave like cells. It is remarkable how tiny, biological cells manage to organize and control thousands of biochemical reactions in their interior and how they coordinate with other cells to form multicellular consortia and complete organisms. Inspired by the capabilities of living cells some scientists are trying to build from scratch artificial structures that resemble living cells using only simple chemical building blocks. We are still far away from an artificial cell that one can consider as “alive” and that can do as well as natural cells. However, while we are trying to mimic biology we get a better understanding how natural cells function, and one day we might end up with microscopic machines that can perform specific tasks or produce chemicals for us. Three years ago I joined Neal Devaraj’s lab at UCSD and his DOD-funded multidisciplinary collaboration with research groups at UCSD and other universities on artificial cells. Neal and I thought that it would be extremely important that artificial cells could take up molecules from the environment and secrete others. This exchange with the environment would enable them to send and receive signals to communicate with other artificial cells and to take up nutrients and excrete waste. What is great about engineering artificial cell-mimics is that we are not limited to the biochemical processes and building blocks that nature uses. Living cells have phospholipid membranes but we can engineer artificial cells with completely non-natural membranes that are more stable and more permeable. I came across a neat paper1 about producing porous polymeric microcapsules in a microfluidic device. We thought polymer membranes might be more stable and more permeable than lipid membranes. Additionally, microfluidic production of our artificial cell-mimics might result in highly uniform populations of cell-mimics. But would we be able to encapsulate biomolecules and get gene expression to work inside these unnatural membranes? For it to work we needed a way to trap DNA inside cell-mimics. Another interesting paper2 described a hydrogel formed from clay minerals and DNA that left DNA accessible for mRNA synthesis. Could we use a hydrogel to confine DNA to cell-mimics? We gave it a shot and it actually worked! It was an exciting moment to see my first polymeric cell-mimics under the microscope. To check for encapsulated DNA, I added a fluorescent dye and saw something interesting. It looked like our cell-mimics had “nuclei”. I could see small bright spots in all of the cell-mimics containing DNA. The hydrogel had condensed into round structures in the cell-mimics’ interior that resembled a cell’s nucleus. Just like real, cellular nuclei, our artificial nuclei could express genes. We tested this by expressing a fluorescent reporter protein, which we had fused to a DNA-binding protein, so that it accumulated in cell-mimic nuclei that contained DNA with binding sites. Figure 1. 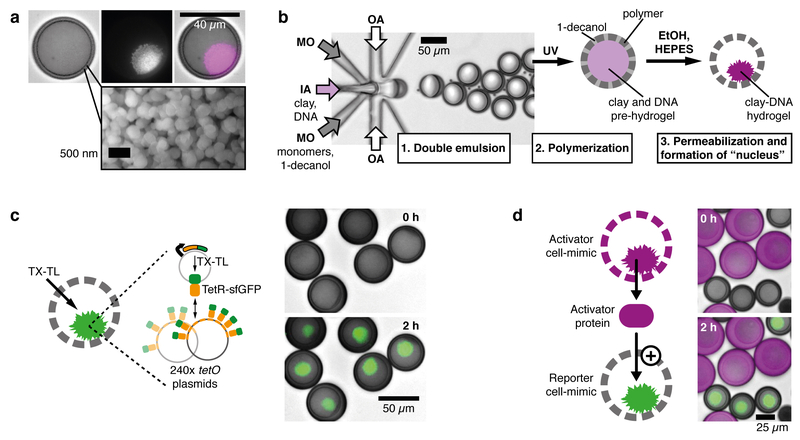 Cell-mimics with artificial nuclei express genes and communicate. a) Optical micrographs (top) of a cell-mimic with GelRed stained hydrogel nucleus (merge of brightfield and red fluorescence) and scanning electron microscopy of porous cell-mimic membrane (bottom). b) Microfluidic production of double emulsion droplets encapsulating a pre-hydrogel in a photocurable middle layer, and schematic of subsequent processing steps. IA: Inner aqueous, MO: middle organic, OA: Outer aqueous phase. c) Expression and capture of TetR-sfGFP reporter protein in hydrogel nuclei. TX-TL: Transcription and translation reagents. d) Communication between cell-mimics via a diffusive genetic activator protein. With their plastic membrane and their clay mineral nucleus our cell-mimics are made of non-biological materials. Nevertheless important biological processes like transcription and translation worked well showing that we can combine biological and non-biological materials to build artificial cells with new functions. We showed that cell-mimics were able to communicate with neighboring cell-mimics and collectively sense their population density similar to bacterial quorum sensing. We are excited to find out how our cell-mimics can be developed further in the future. We envision that communicating cell-mimics could be assembled into synthetic tissues, in which genetic networks cause patterns to emerge in large, multicellular arrangements. 1. Kim, B., Jeon, T. Y., Oh, Y.-K. & Kim, S.-H. Microfluidic Production of Semipermeable Microcapsules by Polymerization-Induced Phase Separation. Langmuir 31, 6027–6034 (2015). 2. Yang, D. et al. Enhanced transcription and translation in clay hydrogel and implications for early life evolution. Sci Rep 3, 3165 (2013).